Handcrafted from solid hardwood,with a simple, stylish design and classic Shaker influence that is evident in every detail of this beautiful canopy bed, it's no wonder this versatile bed has remained one of our customer favorites over the years. Available in your choice of Twin, Twin XL, Full, Queen, King or California King, this bed can be made to fit any bedroom you choose, and with the classic canopy that sits above the headboard and footboard, this gorgeous bed is sure to have a presence to serve as the centerpiece to your entire suite! Straight from a story book and into your home, we're sure you'll love falling to sleep in this beautiful bed after a long day! Each bed is bench built to order by skilled Amish woodworkers and finished with an heirloom quality that ensures your investment will last generations! Shown here is wormy maple wood, you can also choose to have this bed made from cherry wood or solid oak. Once you've chosen the perfect size and wood, choose from an array of finishes, ensuring your new bed will match seamlessly with your decor! We also off a natural tung oil finish for those that are sensitive to stains and varnishes off gassing. We can also do a low VOC varnish or custom stain matching upon request. 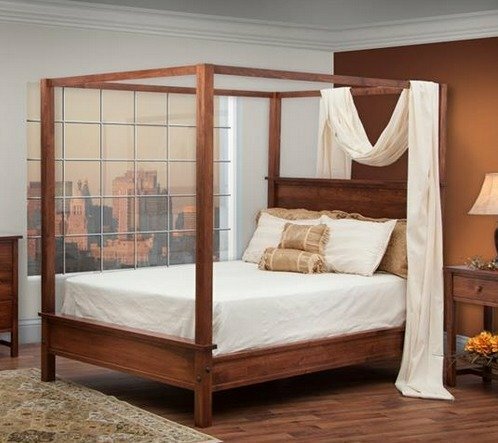 This solid wood Shaker Canopy Bed will bring a bit of romance into your bedroom. But, for those with height restrictions, the Shaker Panel Bed offers the same style without the canopy. Mortise and tenon construction is used on the bed corners for added strength. The bed rails are bolted together with a through bolt and barrel nut. Each bed has five slats of which two have center supports on the queen and king beds. On all king and queen beds there will be 5 slats / 2 with props. Two slat supports are needed to meet the mattress manufacturers warranty requirements. They simply attach to the bottom of the slats. All of our Shaker bedroom pieces are made in America and feature an authentic design founded on timeless traditions of Shaker furniture. It is made with the highest attention to quality in design, workmanship, wood selection and finishing. If you have any questions or if you would like to customize this solid wood bed in any way, please give one of our Amish Furniture Specialists a call at our toll free number - 866-272-6773. We are also easy to reach through chat online or email at - Questions@DutchCrafters.com. Thank you for choosing DutchCrafters for all of your bedroom furniture needs! Buying custom-made furniture online seemed like a risky endeavor but thanks to the great customer support I had before any work began helped ensure I got exactly what I wanted. We must have gone through a dozen wood samples/finishes to find what turned out to be the perfect match to my existing furniture. I really appreciated that I never felt rushed or pressured to make a choice... Shannon kept providing me with additional samples as we narrowed down the choices. And then there's the finished product... which is quite likely the nicest piece of furniture I've ever owned. The workmanship is topnotch and reflects a craftsmanship that you rarely see these days. I know that if I am ever seeking any other furniture, I won't hesitate to return to Dutchcrafters.